The story of the invention of the high five is the stuff of legend. People too young to remember might believe that the high five was around in prehistoric times. How else would cave men greet one another? While we might believe that Victorian gentlemen and women would slap their hands against one another to celebrate a rousing game of croquet, the truth is that the high five was not a part of the Oxford dictionary until 1980. 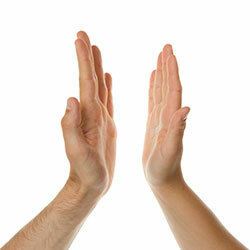 Although the low five had been common since World War II, no one thought to raise it up high for more than 30 years. As with most legends, the actual origin is disputed, but the most widely accepted story is that the high five was invented on October 2, 1977 in a Major League Baseball game between the Los Angeles Dodgers and the Houston Astros. The Dodgers were at the end of a successful season and were headed to the playoffs. The atmosphere in the packed stadium was electric as Dusty Baker hit his 30th homerun of the season, a significant accomplishment. The next batter was Glenn Burke, who had his hand in the air to celebrate. As he rounded third base and approached home plate, Baker reached up and hit his hand. It seemed like the thing to do. The two men had no idea what they had started. The gesture became a symbol for the team and its fans through the playoffs as the team went on to win the pennant. T-shirts were printed with the gesture and the country was exposed to the phenomenon. It took off like wildfire. The high five became a symbol of comraderie and sportsmanship. Hand slaps cut through socioeconomic divisions and sweep aside cultural barriers on their way to meet in the middle and produce a satisfying clap. As it turns out, high fives are an excellent method of boosting self-esteem, and the perfect punctuation for a witty remark. The beauty of a high five is in its simplicity. The action is easy for babies to learn early in their development. For the benefit of billions across the world, the high five has endured, spread, and thrived.